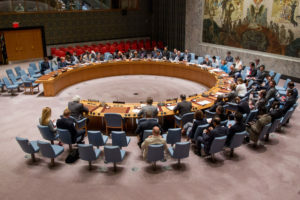 The UN Security Council joined Wednesday the world chorus of condemnations of the series of missile attacks on Saudi Arabia by Yemen Shia Houthi rebels over the week-end. Seven missiles were fired on Saudi Arabia on Sunday by the Yemen rebels where the largest Sunni nation is leading an international coalition to prop up the internationally recognized rule of President Mansour Hadi who lost capital Sana’a and the majority of the northern part of the country to the Iran-backed Houthi rebels. The missiles were intercepted and debris of the projectiles in capital Riyadh left one Egyptian man dead. Saudi forces said they also brought down missiles in the southern cities of Najran, Jizan and Khamis Mushait. The rebels previously launched other missiles. In November a rebel-launched missile landed near Riyadh international airport. The 15-members of the Security Council took a stand against the Sunday attacks by the rebels. The Yemen conflict has entered into the third year with human casualties put at round 10,000 and millions displaced who suffer from starvation. The Security Council stopped short to blame Iran, which, according to Saudi Arabia, its allies and independent UN experts, has been supplying the Shia group with weapons. Independent UN experts reported to the Security Council in January that Iran had violated UN sanctions on Yemen because “it failed to take the necessary measures to prevent the direct or indirect supply, sale or transfer” of ballistic missiles and other equipment to the Houthi group, Reuters reports. Russia last month stood in the way of an attempt by western allies to adopt a UN resolution blaming Iran for arming directly or indirectly the Yemen rebels who vowed to continue attacking Saudi Arabia until Saudi-led coalition stops its raids. Posted by KanelkaTagba on Mar 29 2018. Filed under Headlines, World News. You can follow any responses to this entry through the RSS 2.0. Both comments and pings are currently closed.